I’m a superfood super fan! Each season carries its own variety of superfoods. 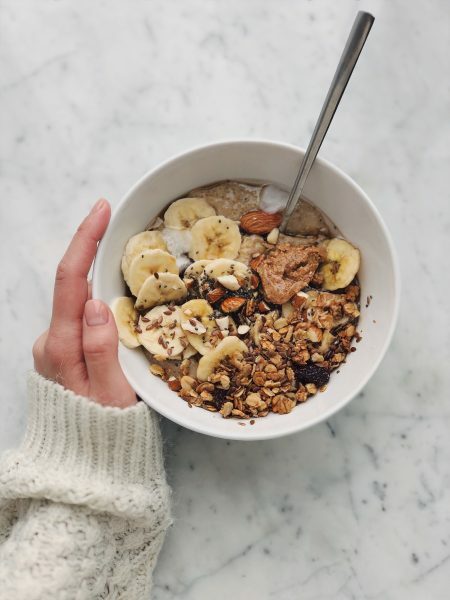 If you are interested in using more superfoods this winter, a great option for you is to make breakfast bowls. You might have heard of smoothie bowls, but that is definitely not the only fun bowl idea for breakfast that doesn’t include cereal. Take a look at these healthy options for your next superfood breakfast. Smoothie Bowl with Pumpkin: Smoothie bowls are popular year-round, as a way to add more superfoods into your diet and have a healthy, yummy breakfast. It may seem weird having a smoothie with pumpkin, but it actually contains the perfect texture and just enough sweetness to make this a filling and healthy breakfast bowl. The trick here is to add banana to the smoothie bowl along with your pumpkin puree, since it is going to sweeten it up. You can then use some almond milk or other milk, along with your choice of spices. Just a little allspice will also work since it combines different flavors in one. For toppings, try chia seeds, ground cinnamon, and walnuts. Apple Quinoa Breakfast Bowl: Here is another tasty breakfast bowl that is going to use those wonderful superfoods, this time lots of apples. Quinoa is added in to give you a healthy grain that is filling and contains plenty of fiber. This quinoa bowl is on the sweeter side, using sliced apples, apple pie spice, applesauce, and some almond milk or soy milk. You can also make it even sweeter with some pure maple syrup drizzles on top. Sweet Potato Breakfast Bowl: This may not sound appetizing right away, but give it a chance! You aren’t just eating a bowl of sweet potatoes; you are combining them with some of the classic fall flavors for a healthy and nutrient-rich breakfast bowl that is easy to put together. In addition to the sweet potatoes, which should be mashed after cooking them, add in a mashed banana and mix it together. You can then add in your spices, whether you add them individually, or go with allspice or a simple pumpkin pie spice. Other ingredients are up to you, though chia seeds and almond milk go really good with this type of breakfast bowl. Pumpkin Spice Oatmeal: This is often a fan favorite, so you should definitely give it a try. You can transform your morning oatmeal into an end of the year spiced delight and make it taste just like pumpkin pie. Some ingredients to use include rolled oats, water, milk, banana, pumpkin pie spice, and your choice of natural sweetener. You can go with agave syrup or a pure maple syrup. Pumpkin puree is of course also added in the oatmeal.